"Banking establishments are more dangerous than standing armies." So wrote Thomas Jefferson to a friend in 1816. 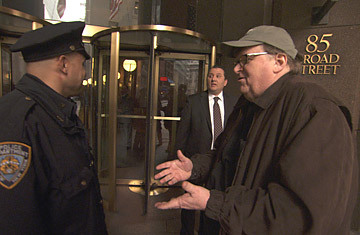 Now Michael Moore, whose Fahrenheit 9/11 took on the U.S. Army, and the entire military-executive-industrial establishment, brings his latest documentary, Capitalism: A Love Story, to the Venice Film Festival. The land of Macchiavelli and the Medici is the perfect setting for Moore's nonfiction tragicomedy of greed and chicanery on Wall Street, in Washington, D.C., and through the entire economic apparatus. The movie will have its world premiere here tonight, before playing the Toronto Film Festival next week, opening Sept. 23 in New York and Los Angeles and achieving wide release Oct. 2. Writing on his web site, Moore proclaimed, "The director of the festival [Marco Mueller] said that our movie was 'incredibly symphonic' and that he was moved by its epic nature. Jeez, these Italians! Everything's an opera to them!" The movie is not opera so much as impassioned journalism  a broadside fired at the good ship Free Enterprise, with the hope of altering its course, and dislodging the pirates who have seized it. Capitalism: A Love Story does not quite measure up to Moore's Sicko in its cumulative power, and it is unlikely to equal Fahrenheit 9/11 in political impact. In many ways, though, this is Moore's magnum opus: the grandest statement of his career-long belief that big business is screwing the hard-working little guy while government connives in the atrocity. As he loudly tried to confront General Motors CEO Roger Smith in Roger & Me in 1989, and pleaded through a bull horn to get officials at Guantanamo to give medical treatment to surviving victims of 9/11, so in Capitalism he attempts to make a citizen's arrest of AIG executives, and puts tape around the New York Stock Exchange building, declaring it a crime scene. Moore's admirers and detractors alike will recognize his methods in the new film: brisk, pointed synopses of complicated issues (though even a Harvard professor has trouble describing what a derivative is); sad tales of working-class families evicted from their homes because their mortgage rates ballooned; a snowbank of statistics, such as that worker productivity has increased by 45% since 1980 while average real income is stagnant; and pert clips ranging from 1950s instructional films to that YouTube favorite, "Cat Flushing a Toilet Music Video." The material is, as always in Moore movies, efficiently and amusingly marshaled to serve the larger theme: that the establishment thrives by cheating ordinary Americans. How so? Moore eagerly counts the ways. He lays out the "Dead Peasants" insurance loophole by which a corporation can take out policies on their rank-and-file workers and, when they die, reap millions in tax-free payouts. To support his position that airlines are risking catastrophe by underpaying their pilots, he excerpts the Congressional testimony of Hudson River hero Chesley Sullenberger, who notes that his pay had been cut 40% and he lost his pension. In an episode that might have come from a Dickens novel, Moore tells of two Pa. judges who shut down a state-run detention center and sentenced children, some for the most minor of infractions, to a facility run by a private company that kicked back millions to the judges. The anecdotes are instructive and appalling; and if they meander off the immediate talking point of the trillions the banks took in bailout money last year and the billions they made in profits this year, they bolster Moore's belief that no one should have been surprised by the collapse of a corrupt system, and the ingenuity with which the big-money boys land on their feet while stepping on ours. He must also have thought that many in his audience would be familiar with the shuttle of heavy hitters between Goldman Sachs and recent Administrations, Republican and Democratic. Moore does summon University of Missouri professor Bill Black, author of the 2005 book The Best Way to Rob a Bank Is to Own One, to describe Robert Rubin, Henry Paulsen, Lawrence Summers, Timothy Geithner and others as "powerful lobbyists from the inside, and we paid their salaries." Black and Ohio Congresswoman Marcy Kaptur are Moore's star witnesses; he gets Kaptur to agree, without too much prodding, that the events of the past 12 months amount to "a financial coup d'etat." The rhetorical pitch keeps rising until, toward the end, Moore suggests a solution: not from the government down but from the grass roots up, through community groups (like LIFFT in Miami), united workers (like those at Republic Windows and Doors in Chicago) and the common decency of elected officials (like the Wayne County, Mich., sheriff who decided to stop foreclosures on his neighbors' homes). At the end Moore says, "I refuse to live in a country like this  and I'm not leaving." But this call to arms demands more than a ringleader; it requires a ring, an engaged citizenry who are mad enough not to take it any more. That's unlikely to happen. Moore's films are among the top-grossing documentaries in history because they are pertinent populist entertainments. The question remains: will Capitalism: A Love Story rouse the rabble to revolt? Or will audiences sit appreciatively through the movie, then go home and play the cat-in-the-toilet video? Download the new TIME BlackBerry app or iPhone app at app.time.com.